At first glance, this sprawling house in Blackrock would appear to be a nightmare candidate for a deep energy upgrade — large and sprawling, and with a mix of structures built at different times and with different materials. 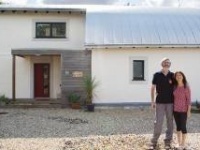 But guided by the passive house standard, the team behind it managed to turn a G-rated energy guzzler into a healthy and very-low energy family home – complete with an A rating. Any builder will tell you that when it comes to refurbishment, you never really know what you’re dealing with until you start opening up the structure. Greenfield builds need careful planning and attention to detail. Retrofits need that, plus imagination and an ability to think on the hoof. A Zen-like calm would also be helpful. When architect Brendan O’Connor of Abode Design set out to extend and retrofit the Regan family’s sprawling home in Blackrock, Co. Dublin, the list of unknowns was substantial. The house itself was 60s era, and probably of hollow block construction, while a 70s era extension on the eastern façade also seemed to be hollow block. Then there was a ‘cottage’ annex to the right, which had a stone façade and merged with an old garden wall. It was anybody’s guess what lay beneath the stone. The client, Pam Regan, also had very clear ideas about the kind of retrofit she wanted for herself and her family. When asked why aim for a sustainable low-energy spec, she asked, why not? “Why wouldn’t you in this day and age? It would be silly not to. It wasn’t a big decision, it was the only way to go.” The problem however was that the house was an affront to sustainable principles. Big where it should have been small, sprawling where it should have been compact, and built with little or no insulation. It was also, she says, very cold. This left Brendan O’Connor with twin challenges. In addition to rationalising the rambling layout and creating a bright, open space more suited to the needs of the family, he also had to transform the house into a warm, comfortable, healthy home without compromising the charm that drew the Regans to it in the first place. O’Connor chose Enerphit, the passive standard for refurbishments, as his guide. This was familiar territory for O’Connor, who was project architect for Ireland’s first – and the world’s 5th – certified Enerphit project, just around the corner at Wynberg Park, while at Joseph Little Architects (a project which featured in issue two of Passive House Plus. The existing two-storey extension on the eastern elevation was judged to be substandard, and was demolished, to make way for a structure of much higher build and thermal quality. Internally, the team stripped out the existing floors and replaced them with a new concrete slab, making it possible to move freely through the ground floor without the need for steps. Internal walls were removed and the design opened up, introducing light deep into the heart of the house. “This is a very active family,” says O’Connor. The ‘cottage’, as it was known, was a single-storey extension on the western elevation that backed onto the lane at the rear of the house. It was stone clad, and appeared quite old. When the structure was investigated however, that turned out not to be the case. “It was all hollow block when we opened up; it was of very strange construction. We got the impression that it was old garden walls and that someone, at some point, decided to put a roof on it.” Rather than demolish the structure, the design team decided to remodel it and place the back entrance here. Extensive use of external wall insulation (EWI) formed a central part of O’Connor’s refurbishment plans. Wrapping the house’s walls with a Baumit EWI system brought the U-values right down – 150mm bringing the existing walls to 0.19, with 200mm on the extension walls hitting a lower still 0.146. 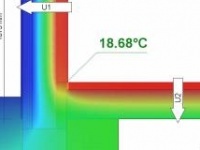 It also formed a central part of the strategy on addressing thermal bridging. “With EWI, it’s quite easy to avoid thermal bridges, because you’re wrapping the house. Specialist thermally broken products were also used diligently where required. Fischer Thermax fixings were used to affix rainwater systems to the EWI layer and Schöck Isokorb connectors were used where balcony and solar shade meet the external walls, in both cases keeping thermal bridging to a minimum. Because of the thickness of the insulation, the windows sit proud of the masonry in order to avoid being lost in the reveals. Support comes from Compacfoam sole plates, a product similar to expanded polystyrene. It’s as dense and strong as timber, but its thermal conductivity is so low that the window reveals do not become thermal bridges, sucking heat out of the structure. The bay windows on the front elevation were however a different matter. When the build team set about removing the old windows, they discovered that they were actually holding up the roof. This generated an immediate need for steel. Typically, says O’Connor, architects like to hide structural details like these in window mullions. That solution would however have introduced a major thermal bridge to the design. Instead, O’Connor asked the engineer to specify steel with the slimmest profile possible, and then placed that steel on the warm side of envelope, just inside the mullion. The design team also sought materials that were fully breathable in order to make sure that the structure could deal effectively with moisture in the build-up. Internal walls were removed and the design opened up, and combined with the Fakro and Velux roof windows this introduces natural light into the heart of the house. Asked what his strategy was for airtightness, O’Connor says that it largely consisted of getting a good builder onsite. Tim Walsh of contractors Brian M Durkan & Co says that achieving airtightness was unquestionably the biggest challenge the build team faced. The central plank of the airtightness strategy was the internal wet plaster finish. Airtightness membranes and tapes were deployed liberally around ceilings, with taping at window junctions too. (above, clockwise from top) metal web Posi joists to intermediate floor of new extension; site works after demolition of an earlier extension; existing walls at lane to the read of the house, with the pebble dash wall in the middle forming of the building’s thermal envelope; Intello membranes and airtightness detailing where the new roof meets the existing external wall. Walsh emphasises the importance of retaining personnel where possible, to keep continuity in terms of quality and delivery overall. “Dermot has been with us 15 years or more, as have many of the lads who work for us. 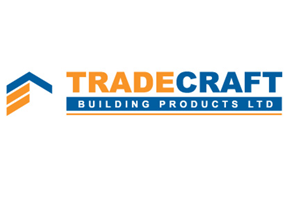 Even many of the subcontractors we work with stretch back to similar periods of time.” This means that once tradespeople have been upskilled for issues like airtightness, the knowledge is retained for future projects. For instance, Walsh points out that on the company’s standard jobs now, if a subcontractor pierces a hole in the airtight layer, it’s become ingrained practice for them to tell the foreman, with impressive results. “We’re typically hitting figures of 1 to 2 ACH on new build projects, without being asked,” he says. In this project, the building achieved an airtightness result of 1.01 ACH – which is within the tolerance limits of the Enerphit benchmark, 1 ACH. Not that it matters. Given the size of the house, the widely dispersed footprint and the variety of materials in the structure, this is an excellent result by any measure. 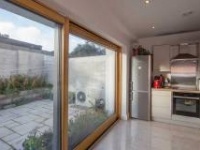 It is however interesting to note that though the design and build team managed to hit this target, the house doesn’t quite make the Enerphit standard, primarily because of the ventilation solution they implemented. Typically, a mechanical heat recovery ventilation (MVHR) system is used in passive houses to deliver cold fresh air from outside, which is warmed using heat harvested from vented stale air. 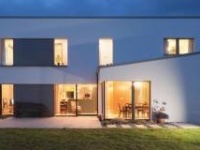 The passive house standard requires air supply to reach certain temperatures before entering the living space, meaning that MVHR systems are effectively mandatory in the northern European climate. These systems are built around centralised fans and extensive ductwork. The bigger and more complex the house, the more pipes you need. In a retrofit situation, charting a course for this pipework can be challenging, to say the least. Instead of one centralised unit controlling the flow of air though the entire house, individual spaces and rooms are fitted with fans that are humidity-triggered. Less power is drawn down because the system is not running constantly (as MVHR does), but because the heat recovery element is now gone, there is a slightly higher space heating requirement. The Regan family moved in last July, so haven’t yet had a winter to test the structure. Pam Regan says however that she couldn’t be happier with it. “It’s gorgeous. I love it. It’s so bright and clean. I smile every morning when I get up and come downstairs." Before: 20 year old oil boiler & radiators throughout entire building. After: Greenstar Cdi high-efficiency condensing gas Combi boiler and radiators throughout. Plus three (Scan, Dimplex, Stovax) room-sealed solid fuel stoves, each having no air exchange with the room and own air supply kit. 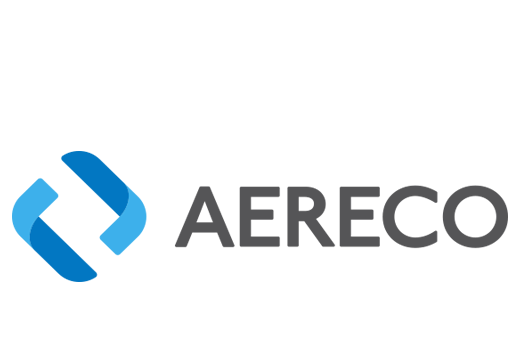 After: Aereco demand controlled mechanical extract ventilation system to the whole house. 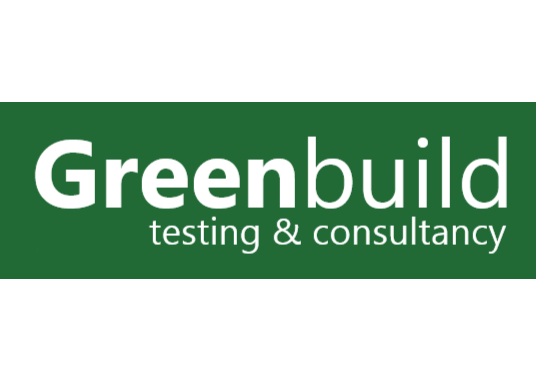 Green materials: All timber furniture from PEFC certified sources, Tricoya to soffits and fascias. First fix completed for rain water harvest system which will capture rain water from most of the roof.